Fresh mackerel is not just a cheap fish to buy, it also one of the healthiest. It was in the danger zone for sustainability for a while but happily is no longer. Pan-frying a mackerel is a popular way to eat this lovely fish, but in the hands of a professional chef it becomes full-on stylish, and of course, is still delicious to eat. The chef in question here is Rob Green. Rob was Seafood Chef of the Year and works in close collaboration with Seafish as an Ambassador for their fish week in October. 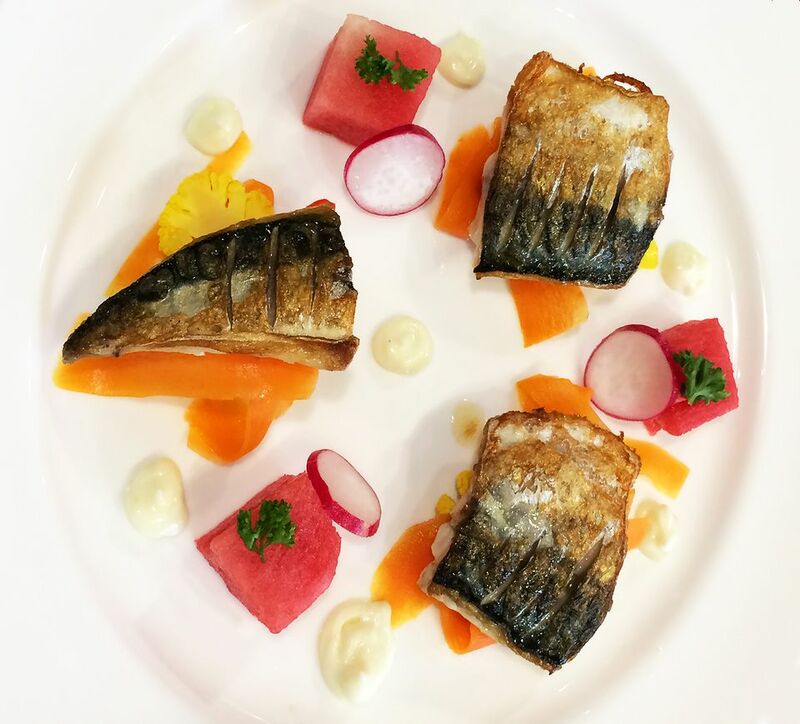 Who better than to take a mackerel and turn it into a picture on a plate. This recipe may sound and look complicated but is in, in fact, straightforward and makes a stunning summer lunch or fish course at dinner. Place all ingredients for the brine into a small saucepan and bring to boil. Simmer for 5 minutes. Add the radishes, onions and cauliflower to the brine and simmer for 2 minutes. Add the carrot ribbons and remove from heat. Set aside. Mix the wasabi and mayonnaise together in a small bowl. Heat a tiny amount of oil in a large frying pan and gently fry the mackerel until just cooked - this should take about three to five minutes. Turn the mackerel once during cooking. Strain the vegetables from the brine and place in them in three piles on a serving plate. Top with a mackerel fillet on each and garnish with the watermelon, Wasabi mayonnaise, and baby herbs (see the image for more detail). Serve immediately. This recipe makes a great lunch or supper dish. This recipe works for mackerel. The oiliness of the fish is beautifully balanced with the sharp, pickling of the vegetables which softens down the whole dish. Both the pickle and the fish are so good for you, really there is no point in playing around with this recipe. If you feel you must, then consider another oily fish (fresh tuna would be good) to ring the changes. Thanks to Rob Green for the recipe.